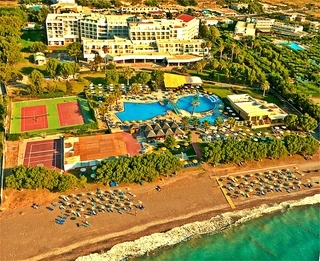 Doreta Beach is an all-inclusive hotel located in Tholos village of Rhodes. 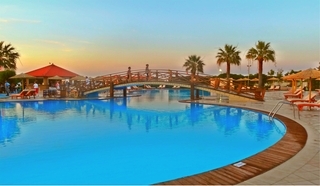 The resort is a perfect destination for holidaymakers of all ages, families, groups, couples and individuals. A total of 390 guestrooms are divided into single, double, triple and quadruple rooms, and maisonettes. 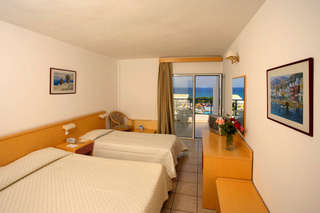 All rooms are decorated with comfortable and modern furnishings with a touch of traditional Greek culture. The amenities include double or twin beds, television, mini-refrigerator, telephone, private bathrooms, etc. 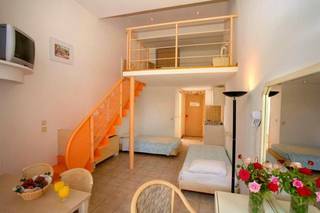 All rooms come with furnished balcony or veranda overlooking beautiful sea or garden views. There is a regular housekeeping service which ensures that your stay is a memorable one. Internet is available in the public areas and can be availed inside the rooms against local charges. The hotel features four restaurants and three bars. 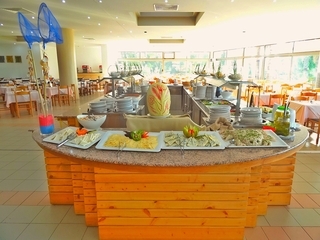 Symposium is a buffet place with international cuisine; Mediterraneo is an a la carte place which serves local and Mediterranean cuisine; as the name implies, Gialos offers a Greek menu with gyros, mousaka, etc. ; Thalassa can be reached for light snacks; Gelateria is a coffee shop; Aegean and Megaron serve alcoholic and non-alcoholic beverages. The hotel sports a number of recreation facilities. These include floodlit, paid tennis court, basketball court, aqua gym, darts, aerobic, minifootball, Boccia, table tennis, minigolf, volleyball, etc. 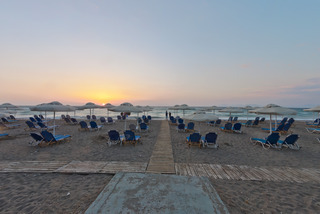 Water sports are available on the beach while a large outdoor swimming pool, children’s pool and spa are there on site with many body treatments, massages, beauty treatments, etc. 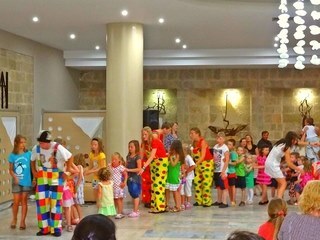 The entertainment teams make sure that guests of all ages are energised, engaged and entertained.There are live music and dance shows, competitions and karaoke for adults while kids and teenagers’ club ensure that the younger guests are also taken care of. The hotel is about 8 km away from Rhode airport and has its private beach (50 metres). There are countless shops and bars in the vicinity. Theologos is the nearest town where you can find a few shops, while Rhodes is about 25 km and Lindos is at 54 km where there are plenty shops and markets. Few more places of interest you might want to take a look at are Valley of the Butterflies (19 km), Palace of the Grand Master of the Knights of Rhodes (22 km), Monastery of Filerimos (19 km), Kahal Kadosh Shalom (29 km), Mandraki harbour (23 km), Panagia tou Kastrou (23 km), Ancient Olympic Stadium (21 km) Acropolis of Rhodes (20 km), etc.